Earlier today, we explained in an article all of the exciting set of new features that are expected to come out of the Mango update for Windows Phone 7, like turn-by-turn navigation, but now it seems that Microsoft will be hosting an event to showcase it. 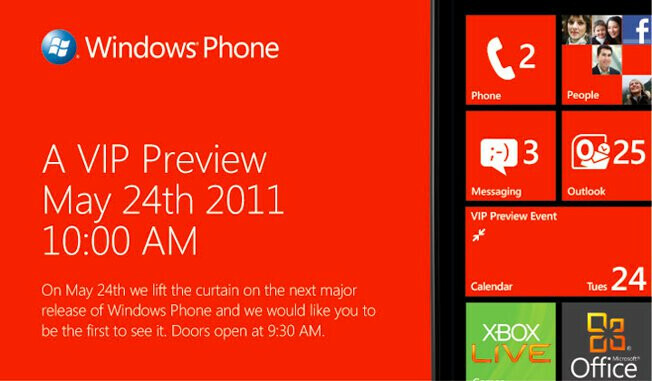 Scheduled to “lift the curtain on the next major release of Windows Phone,” Microsoft is holding a preview event in New York City on May 24th – the same day that Samsung will be hosting their very own event as well. Heading into the scorching summer season, this unveiling can seemingly give the new mobile platform some visibility amongst the competition right now. Naturally, major updates like Mango will undoubtedly rejuvenate the platform so that it’ll be able to compete on the same level as its peers. As much as we’re looking forward to hearing and seeing all the new exciting features coming out of the next major release of Windows Phone 7, it’ll be interesting to find out when exactly existing handsets will see it. No hardware? What is Xbox? At least RIM has a software component to it. 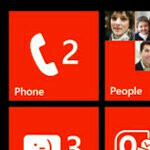 Microsoft will announce Mango and the purchase of Nokia. Thinking about the news of a pending acquisition of Skype by MS, I suspect MS will announce that Skpe will be included in the next update/release of WP7. Then at some later point, Skype won't work with the other other handset OSs (anyone remember 'DOS isn't done until Lotus won't run...'?). Is anyone who currently uses Skype ready to make the switch to WP7? I am not. no i hardly that MS would take such a stupid step. Skype in itself is an awesome service and has very diverse customer base and a lot of people have started using it on mobile phones now for easier and cheap Voip calls, including me. Making it exclusive to WP7 will definitely cause skype to lose a whole chunk of customers, and eventually it will lose its competition in the voip segment. What i think will happen is that MS will integrate Skype deep into WP7 and give it a unique advantage over other OS applications. thats all. Mango is certainly going to be there, its confirmed...I'm hoping that they will NOT announce any Nokia's yet...I rather wait for something epic,in a few months time, than a rushed out device..
MAY 24TH IS SOOOOO CLOSE!! CANNOT WAIT!